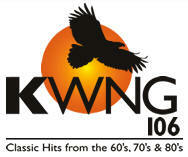 Do you have photos, historical accounts or other items pertaining to the Red Wing area? Would you like to share this historical information with the world? 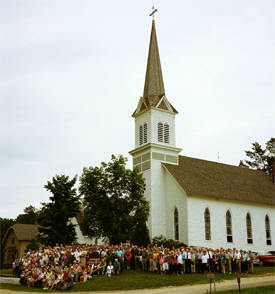 LakesnWoods.com would like to publish your Red Wing photos (current or historical) or historical accounts on this website. Original materials can be returned and your privacy will be respected. 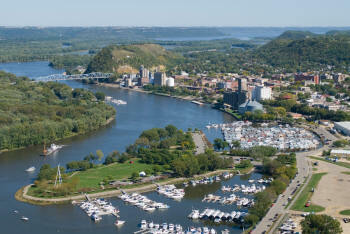 Red Wing is a city of just over 16,000 people nestled amidst the scenic bluffs of the upper Mississippi River. A booming regional center for tourism, medical care, industry and technology, Red Wing offers visitors, residents and businesses the warmth of a small community with the convenience of a nearby major metropolitan area. Natural resources abound with Red Wing's riverfront, winding paths through the majestic bluffs, bike trails, streets lined with colorful flower baskets known worldwide and 35 immaculately maintained city parks. 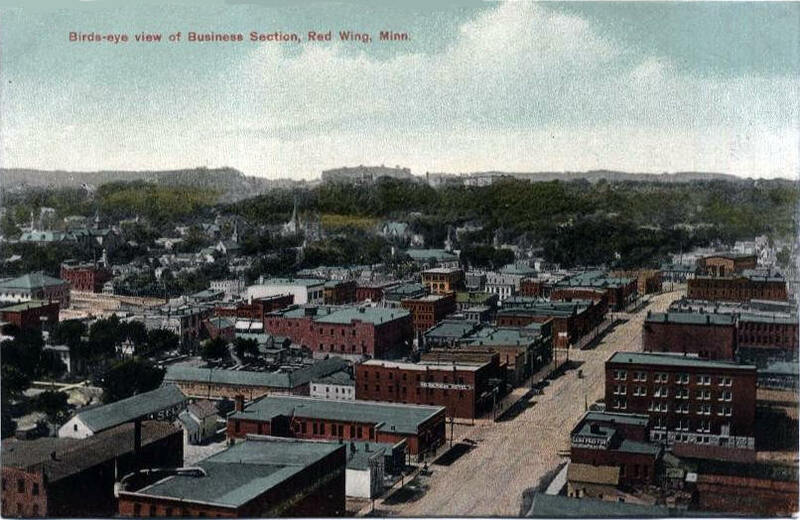 A growing, progressive and safe city, Red Wing is proud of its heritage, the home it offers residents today and its promise for the future. 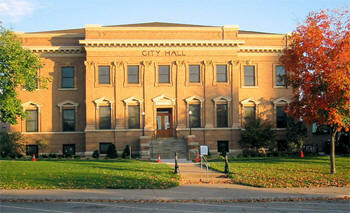 Red Wing is a city in Goodhue County, Minnesota, United States, on the Mississippi River. U.S. 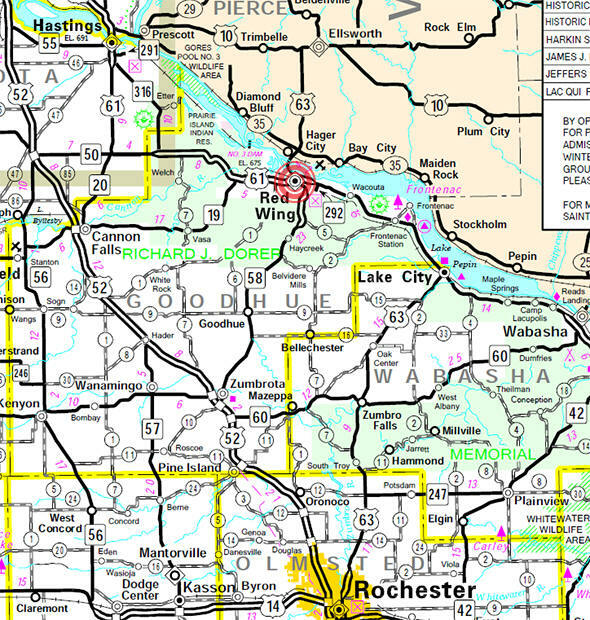 Routes 61 and 63 and Minnesota State Highways 19 and 58 are the main intercity highways. Minnesota State Highway 292 also is in the city. Red Wing is connected to Wisconsin by Red Wing Bridge (officially named the Eisenhower Bridge); it carries U.S. Route 63 over the Mississippi River and its backwaters. According to the United States Census Bureau, the city has a total area of 41.19 square miles (106.68 km2), of which 34.60 square miles (89.61 km2) is land and 6.59 square miles (17.07 km2) is water. The elevation is 750 ft (226 m) above sea level. As of the census of 2010, there were 16,459 people, 7,017 households, and 4,328 families residing in the city. The population density was 475.7 inhabitants per square mile (183.7/km2). There were 7,539 housing units at an average density of 217.9 per square mile (84.1/km2). The racial makeup of the city was 91.5% White, 1.9% African American, 2.2% Native American, 0.8% Asian, 1.2% from other races, and 2.3% from two or more races. Hispanic or Latino of any race were 3.7% of the population. There were 7,017 households of which 28.0% had children under the age of 18 living with them, 46.6% were married couples living together, 10.6% had a female householder with no husband present, 4.5% had a male householder with no wife present, and 38.3% were non-families. 32.2% of all households were made up of individuals and 14.6% had someone living alone who was 65 years of age or older. The average household size was 2.27 and the average family size was 2.84. The median age in the city was 41.8 years. 22.5% of residents were under the age of 18; 7.8% were between the ages of 18 and 24; 23.9% were from 25 to 44; 27.7% were from 45 to 64; and 18.2% were 65 years of age or older. The gender makeup of the city was 48.6% male and 51.4% female. In the early 1850s settlers from Mississippi River steamboats came to Red Wing to farm the lush fields in Goodhue County. They grew wheat, annual crop of which could pay the cost of the land. Before the railroads crisscrossed the territory, Goodhue County produced more wheat than any other county in the country and in 1873 Red Wing led the country in the amount of wheat sold by farmers. The warehouses in the port of Red Wing could store and exported more than a million bushels of wheat. Once the railroads connected southern Minnesota with Minneapolis and Saint Anthony, where the largest flour mills were built, the port at Red Wing lost prominence. In the last half of the 20th century, the United States Army Corps of Engineers built locks and dams and deepened the channel in the river. These reinvigorated river traffic for shipping grain and coal, however the tourist trade has never returned. The first settlers in town built small mills, factories, and workshops, similar to ones they were familiar with in New England where many came from. Immigrants from Germany, Ireland, and Sweden were also skilled craftsman. Some early and persistent industries are tanning and shoe-making. Other businessmen made farm equipment, bricks, barrels, boats, furniture, pottery, and buttons. Consumables included beer and lumber. Service industries including stone-cutting, hospitality, and retailing. The Saint James Hotel remains a working token of the earlier time. The Red Wing pottery and stoneware industry developed on the northwest of the city, close to Hay Creek. It used clay from the area of the Hay Creek headwaters, close to Goodhue, near a hamlet named Claybank. A railroad branch line was built to carry clay to Red Wing. The factory buildings remain, but only traces of the railroad, abandoned in 1937, are left. 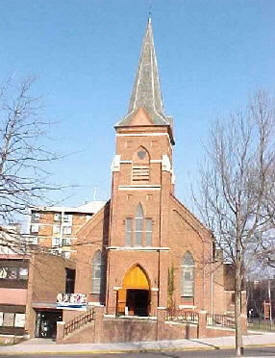 RED WING, the location of a mission to the Dakota in 1837 by two Swiss missionaries, Samuel Denton and Daniel Gavin, was first settled for farming and Indian trading in 1850-52; was chosen to be the county seat in 1854; was incorporated as a city March 4, 1857; and received new municipal charters on March 3, 1864, and February 21, 1887. It was platted in 1853, and its post office began in Wabasha County in 1850, known briefly as Wah-coo-ta before transferring to Goodhue County as Red Wing. The village had a station serving several railroad lines. 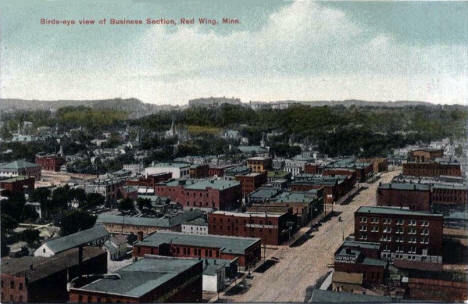 Birds eye view, Red Wing Minnesota, 1910's? Three fun filled days of music, food, free concerts, kids games, crafts, commercial marketplace, rubber duck race, water ski show, parade, car show, Miss Red Wing Pageant and so much more. 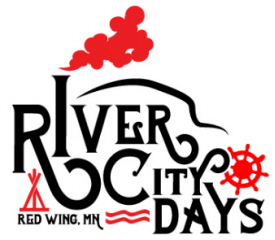 There is something for everyone at Red Wing River City Days! museum most Fridays, Saturdays, and Sundays in downtown Red Wing. 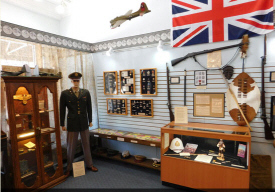 Two Civil Air Patrol members operate the museum, Col Dale Hoium and Lt Col Bruce Sexton, and are often on hand to answer any questions that may be had. Set on 330 acres in the blufflands region of the upper Mississippi, the Anderson Center provides artists, writers and scholars with dedicated time and space to pursue their work. The emphasis of process over product leads to an exciting environment that enables risk- taking, allows for new directions, and is deeply respectful of both the creative individual and his or her work. 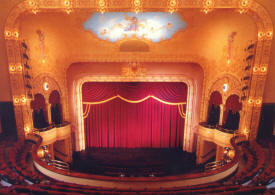 The History Center is three floors and their are exhibits on all three floors. 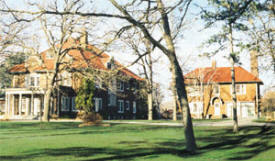 One of the popular exhibits is the one-room school. Everyone likes to have the opportunity to sit at one of the student desks and see how it was to attend a small rural school. Other exhibits highlight other parts of the Goodhue County. One particular exhibit that changes more frequently is an exhibit devoted to the townships of Goodhue County. 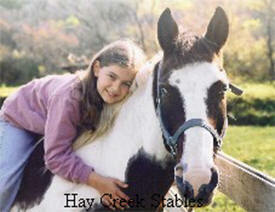 Offering guided trail rides, private riding lessons, group lesson and day camps. 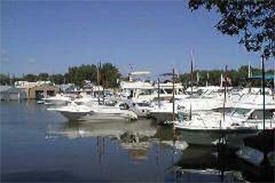 Make your next port of call Red Wing Marina, the friendliest marina on the Mississippi. Come join your friends on the new 'Port o Call Deck' watching Ole Man River and beautiful sunsets. Whatever floats your boat, you will find it here at Red Wing Marina, featured in Heartland Boating Magazine and voted in U.S. Boating as Boaters Choice Marina. Red Wing is steeped in history and Red Wing Trolley Company is here to tell you about it. Travel back in time and tour beautiful Red Wing in our Victorian trolley. 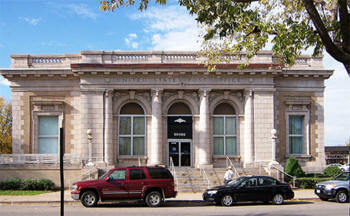 Based at the historic Depot, 420 Levee Street. 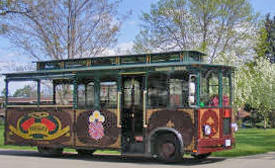 The trolley runs Memorial Weekend thru October. (weather permitting). 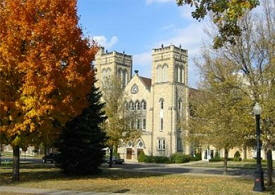 Our narrated tour lasts about 50 minutes with stops all around beautiful Red Wing. Go all in any which way you choose. Find a hot slot. Or try your luck at the blackjack and poker tables. If the gaming you prefer includes tees or pins, step into our 24-lane Brunswick™ bowling alley or hit the links at our 18-hole golf course, Mt. Frontenac. Any path you choose is sure to lead to a great time. The City of Red Wing is proud of the Colvill Aquatic Center. 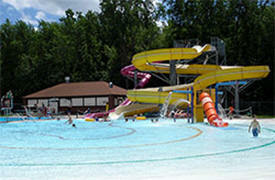 The beautiful facility is an outdoor water park that sits next to the Mississippi River in Colvill Park. The pool has two large water slides, a zero-depth entry, an interactive play area in the water for the young kids, and diving board. In addition, there is a sand play area for the younger crowd, lounge chairs and large sun umbrellas, picnic shelters and a concession stand. When complete, the Goodhue Pioneer State Trail will connect the cities of Red Wing, Goodhue, Zumbrota, Mazeppa, Bellechester, and Pine Island for a distance of 47 miles. Currently there are two sections of the trail. 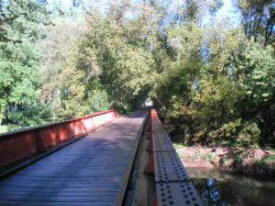 In the northern portion, there are four miles developed, paved trail from Red Wing to Hay Creek. The southern portion of the trail starts in Zumbrota and heads north for 5.5 miles, it is natural surface tread way and is used by hikers in the summer and snowmobiles in the winter. Memorial Park Trail features five miles ski trails, which for the most part are of an intermediary level, winding through rolling, wooded trails to Memorial Park, as well as a clubhouse that is open to skiers. Public course (par 71) 36 holes. 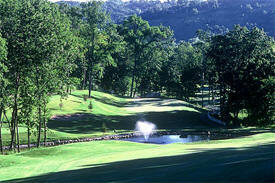 Lowlands Course - Beautiful Championship 18 hole course weaving in and around the bluffs of the Mississippi River Valley. Highlands Course - Championship 18 hole course highlighted by dramatic views and elevation changes. Mississippi National Golf Links was voted as the #1 golf course in Southern Minnesota by readers of Rochester Magazine. 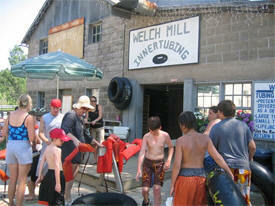 Welch Mill Canoeing and Tubing offers a five and twelve mile canoe and kayak trips for canoers of any experience level. Tubers can choose from a long or short trip. Shuttle service, life jackets and paddles are included with all rentals. Group rates are available. Welch Mill Canoeing and Tubing is open daily in the summer (Memorial Day Weekend through Labor Day Weekend), at 10 a.m. during the week and 8 a.m. on weekends. During April, May, September, and October call for hours. 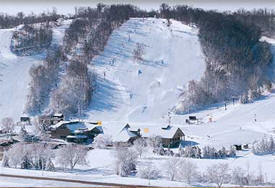 The resort offers two base facilities and 50 runs, which makes it one of the largest winter resorts in Southern Minnesota. We offer specialty care, close to home for primary care and a full range of specialties. In an emergency, our Level III Trauma Center provides state-of-the-art care with connections to some of the country's finest health care facilities in the Twin Cities and Rochester. Red Wing Health Center is a 145-bed skilled nursing facility set on a bluff overlooking the Mississippi River in historic Red Wing, MN. We are rehab focused and goal based. Our nursing department performs more complex medical care than traditional nursing facilities, allowing us to serve more people in need. 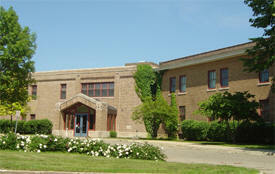 Red Wing Health Center is specially licensed by the state of Minnesota for brain injury rehabilitation. 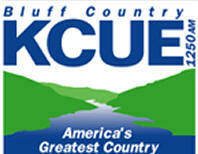 KCUE-AM - 1250 - "Bluff Country"
This 132-year-old home was originally built by the manager of the Red Wing Stoneware Company, and like a fine piece of pottery, the Candlelight was artfully crafted with supreme attention to detail. Because the home has been so well-maintained over the decades, many original features are still present today. Exquisite stained-glass windows; intricate butternut woodwork on the staircase, library and front hall; and Quezal light fixtures are just a few original details that make the Candlelight such a special destination. 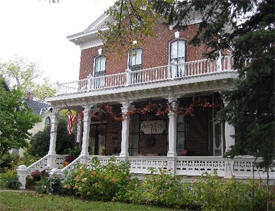 The Golden Lantern Inn is a luxurious bed and breakfast located in the heart of Red Wing's historic district. Guests are treated to a list of amenities including fireplaces, whirlpools, private balconies, in-room breakfasts, extensive gardens and an outdoor fireplace. 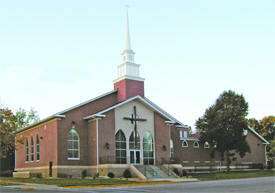 Close to golf, boat launches on the Mississippi, restaurants, shopping. 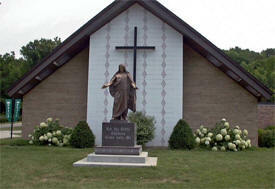 Also close to Treasure Island Casino, downhill skiing and a swimming beach on Lake Pepin. A great place for a romantic getaway or special occasion. 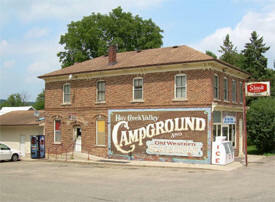 Voted as one of ten awesome inns in the Minnesota Monthly magazine ('06). Minutes to historic Red Wing and even closer to the Cannon Valley Trail and Welch Village for biking, skiing and river sports. Rain showers in each of the Inn's bathrooms. TV/DVD available on request and wireless internet. Children welcome in my century old cottage. 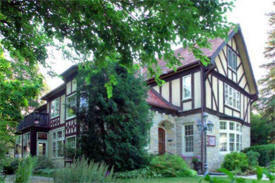 The most elegant scrapbooking retreat center in Minnesota is The Legacy House near downtown Red Wing. 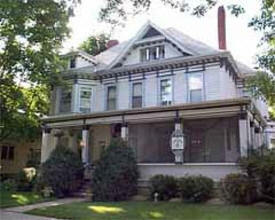 This fully restored home built in 1908 was designed by the famous St. Paul architect Clarence Johnston. 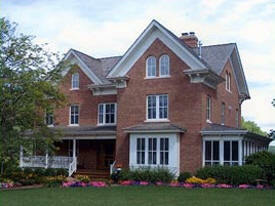 This Arts & Crafts style home is the ideal setting for gathering with friends to design and archive your legacy. 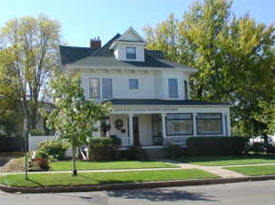 7000 square foot guest house available near downtown Red Wing. 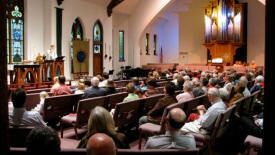 Please visit our web site for more information and availability. Two night minimum stay required. Drive one hour from Minneapolis and St. Paul or from Rochester, Minnesota and completely relax at the Moondance Inn Bed and Breakfast. Your spacious guestroom features a private bath with a two-person whirlpool, fireplace, CD player, and central AC. A sumptuous full breakfast is always included. 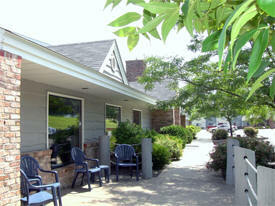 The Inn is centrally located giving easy access to all area restaurants, shops, and attractions. 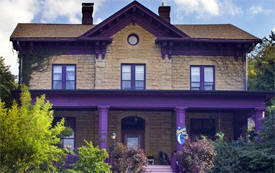 a restored 1876 Bed & Breakfast offering a magical twist to today’s standard fare. Our rooms are decorated with the Innkeeper’s special touch... Beautiful fabrics, romantic old-fashioned creativity with a casual attitude and an invitation to send you back to a more gentler time. Fireplaces, comfortable beds, fine linens, private baths, line-dried sheets, fresh flowers, home-baked goodies, full sumptuous breakfasts and candlelit evenings await you. And in balmy weather enjoy a lemonade, a good book or a memorable conversation on one of our three comfy porches. Come to the country! Come to the Round Barn Farm Bed and Breakfast where old fashioned American and European ambience meet in a 3-story bracketed country manor farm home, just outside Red Wing Minnesota. The residence is a delight. Built on a design from 1861 by architect Samuel Sloan, the use of reclaimed timbers and country antique furnishings combine to deliver the atmosphere, comforts, and charms of days gone by. 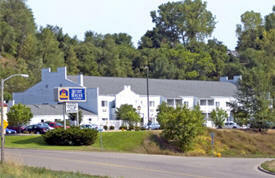 The AmericInn is located off Hwy 61 in beautiful Red Wing, MN. Red Wing is the home of the famous Red Wing Pottery. Enjoy our enhanced continental breakfast featuring waffles, french toast and much more. 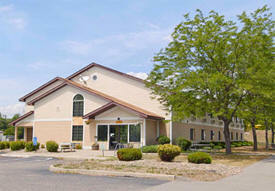 Enjoy our large indoor pool, whirlpool and sauna. We offer Standard rooms with two Queens and Suites with whirlpools. 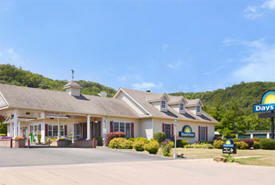 Enjoy nearby Treasure Island casino, Cannon Valley Bike Trail, marina, golf, bowling, antiques, movies and skiing. 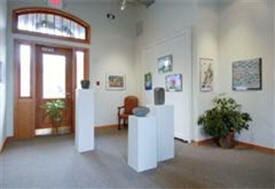 Large lobby with fireplace for visiting, reading, and relaxing. This Red Wing, Minnesota hotel is less than a mile from the Mississippi River and offers elegant luxury suites with whirlpool or specialty theme rooms. The Best Western Rivertown Inn & Suites is close to the Cannon Valley Bike Trail, Prairie Island Mdewakanton golf course, snow skiing resorts and a variety of water activities at the numerous local lakes and rivers. All new rooms and are constantly being inspected and improved providing the guests with a comfortable and clean room to spend the night or many nights. We offer rooms that include gourmet coffee, hair dryer, microwave ovens and refrigerators. The Mississippi River and 2 Marinas are located directly across the street within walking distance, and casinos are located just 12 miles from the Days Inn. 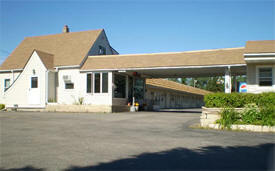 The Nichols Inn, is located off Hwy 61, built in May of 2005, this motel is constructed with solid masonry construction to ensure a quiet stay. Our 42 rooms consist of either 1 king bed, 2 queens or stay in one of our extended stay suites that have a separate bedroom and kitchen facilities. Continental breakfast is served each morning, featuring waffles & french toast. Three floors with elevator. All rooms have coffee/makers, iron/boards, hairdryers and wi-fi internet. Additional amenities: Microwave in room, in-room coffee maker, and Refrigerators in room. 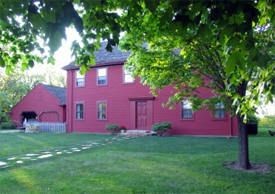 free wireless internet, cable TV with HBO, Large family unit, free local calls, some rooms with recliners. etc. 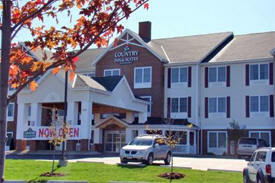 The Rodeway Inn® hotel is within walking distance of the Cannon Valley Trail, a 19.7-mile long trail where visitors can enjoy walking, hiking, bicycling, in-line skating, skateboarding and cross-country skiing, and historic Pottery Place Mall. This Red Wing hotel is near the Mississippi River and just 10 miles from Welch Village Ski and Snowboard Area and Treasure Island Casino. 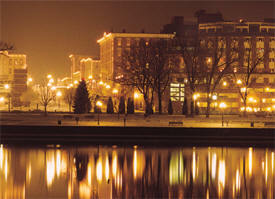 There are few places as gratifying as the St. James Hotel in Red Wing. From eagle watching to skiing, there’s plenty to do outside. Or, if you prefer, there’s really no need to leave the building once you arrive. Fabulous restaurants and an intimate lounge. Luxurious rooms and a pampering spa. Book today and let us create a memorable experience for you. We have 60 well appointed guest rooms which feature wireless high speed internet, hair dryers, refrigerators, and irons/boards. 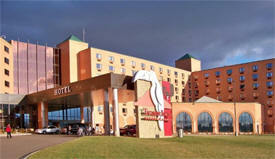 Our variety of guest rooms offers the business traveler and the leisure traveler comfortable surroundings. Treat yourself to one of our jacuzzi suites which feature all of the standard amenities plus a microwave, coffee maker and sofa sleeper. If your trip to the Island includes an overnight stay, we have accommodation options to fit any level of luxury and convenience. Opt for our spacious rooms, indulge in a suite or select your place of R&R from our marina or RV park. And then leave the everyday hassles far behind. 31655 Hwy. 58 Blvd. So. 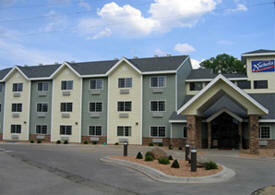 Located six miles south of Red Wing, MN, we are nestled in beautiful Haycreek Valley at the foot of the hills. We're proud to offer you a peaceful and friendly setting as well as a memorable camping experience that your family will treasure for years to come. 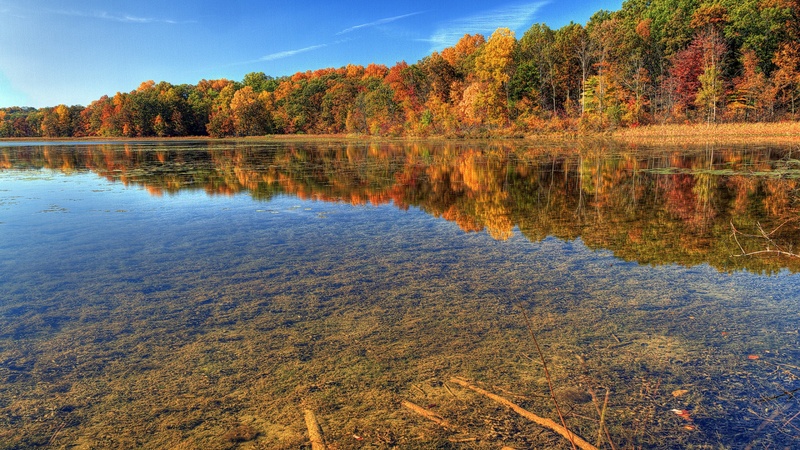 Visit us soon and see for yourself the beauty of Haycreek Valley! Pull up and park your RV at the Island if you wish. 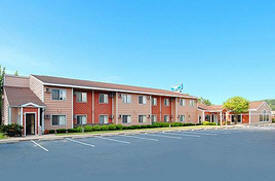 Our 95-pad park includes all the hookups you need, including water, sewer and electricity. Those who enjoy camping can sing around the campfire or cook a barbeque dinner with on-site fire pits. Complimentary shuttles between the RV park and casino take place day and night. The Red Wing Business Directory is Coming Soon!